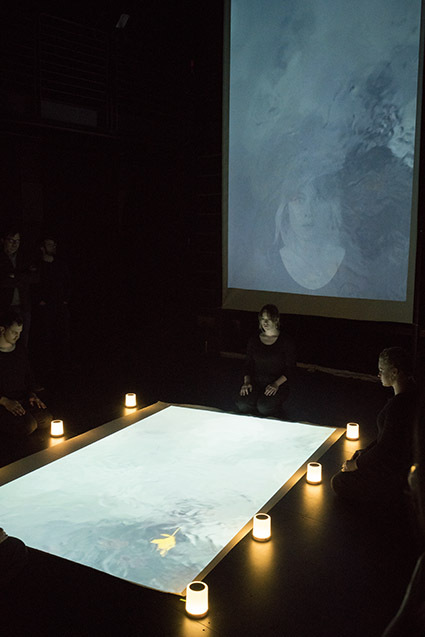 Among Rivers is an event in which audience members move about a large space in which there are four performers, four video projections on the walls with an additional three on floor canvasses, and three circles of loudspeakers extending from floor to ceiling. Lanterns doubling as loudspeakers are deployed at changing positions on the floor. The images are nearly all of river surfaces, sometimes layered with photographic portraits. The sounds derive from flowing water and rain, supplemented by voices and percussive stones employed by the performers. The piece was performed six times from March 15-19, 2019 in the Moody Center for the Arts, Rice University, Houston.